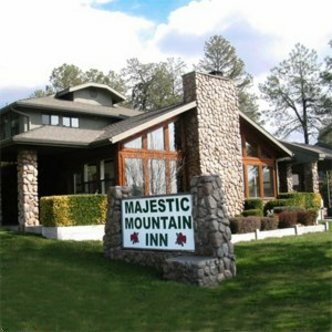 The unique Majestic Mountain Inn is nestled in the tall Ponderosa Pines of Payson in the heart of Arizonas Rim Country. Guests will enjoy the clean, crisp air and relaxing environment while staying in the finest accommodations in the region. Easily accessible by car, the Majestic is a beautiful one hour drive northeast of Scottsdale, Arizona. Independently owned and operated, the Majestic Mountain Inn was designed thoughtfully to allow guests to experience the ultimate in style, comfort, and relaxation. With three room options to choose from, the amenities are abundant and include French Country decor, gas fireplaces and romantic two-person Jacuzzis. Whether it is a romantic weekend or business trip, the Majestic has a variety of accommodations to suit your needs and desires. The Majestic Mountain Inn also features a beautiful conference center that is an excellent facility for business meetings, team retreats, or employee training. Next-door is Paysons newest steakhouse, Fargos, a short walk away for fine dining and refreshment. A warm and friendly staff will provide you with information about local sites you may wish to visit including the Tonto Natural Bridge, the historic Strawberry School House, Green Valley Lake Park and the Rim Country Museum and many other points of interest. Make your visit to Payson and the Rim Country an exceptional experience.